Bulbophyllum weinthalii was first described by Richard Sanders Rogers in the “Transactions Of The Royal Society of South Australia” in 1933. 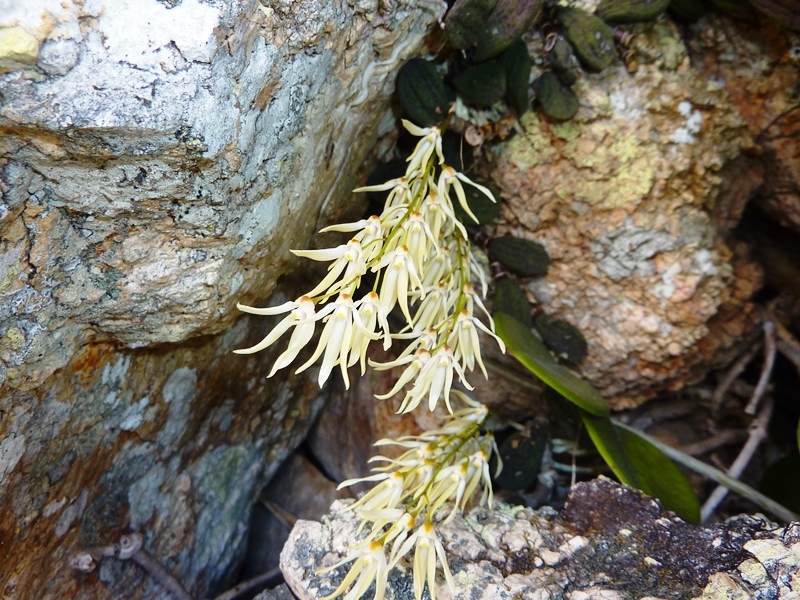 Within the genus Bulbophyllum, it is the only member of its section. The distribution of B. weinthalii was previously accepted as being from Toowoomba in south-eastern Queensland to the Dorrigo Plateau in north-eastern New South Wales (Dockrill, 1969). In his book “Native Orchids of Australia”, David Jones erroneously gives the distribution of B. weinthalii as being from Toowoomba to the McPherson Ranges. This is obviously an accidental oversight because the type material for the species was obtained from Dorrigo, 220 kms to the south of the McPherson Ranges. 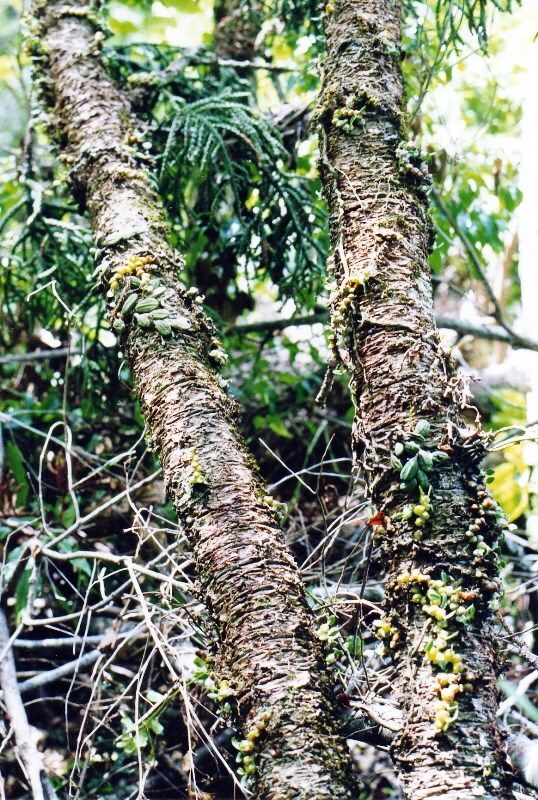 B. weinthalii is virtually confined to the Hoop Pine (Araucaria cunninghamii) for a host although in 1983 I observed a single clump growing on rock at Lanes Lookout on the Dorrigo escarpment. This rock was nonetheless situated under a small stand of mature Hoop Pines. During September 1992, 1 visited State Forest Number 316 which straddles the Calliope and Dawes Ranges, approximately eighty kms west of Gladstone in central coastal Queensland. On the morning of Monday, September 7, we descended into a steep, damp valley below the north-east facing escarpment. There were many huge, unlogged Hoop Pines in the locality. On the fallen branches of the Hoop Pines we were amazed to discover large quantities of B. weinthalii. Several of these orchid plants displayed healthy seed pods. In the main, the numerous plants observed were quite robust. Other orchid species growing in the Hoop Pines were Dendrobium speciosum variety grandiflorum, D. linguiforme variety nugentii, D. gracilicaule, D. teretifolium variety aureum and Sarcochilus falcatus. On the morning of Wednesday, September 9, we entered into the headwaters of a large creek, which flows south-west into the Fitzroy Drainage System. This location was around ten kms from the first. This valley supports very extensive, almost pure stands of Hoop Pine. We immediately encountered many fine clumps of B. weinthalii on the numerous fallen Hoop Pine limbs. Other orchids present included: D. linguiforme variety nugentii, D. gracilicaule, D. teretitolium variety unknown (it certainly was not variety aureum) and S. falcatus. There was no D. speciosum on the Hoop Pines in this spot. This second location for B. weinthalii was considerably drier than was than the first. In both instances the altitude was approximately 700 metres. 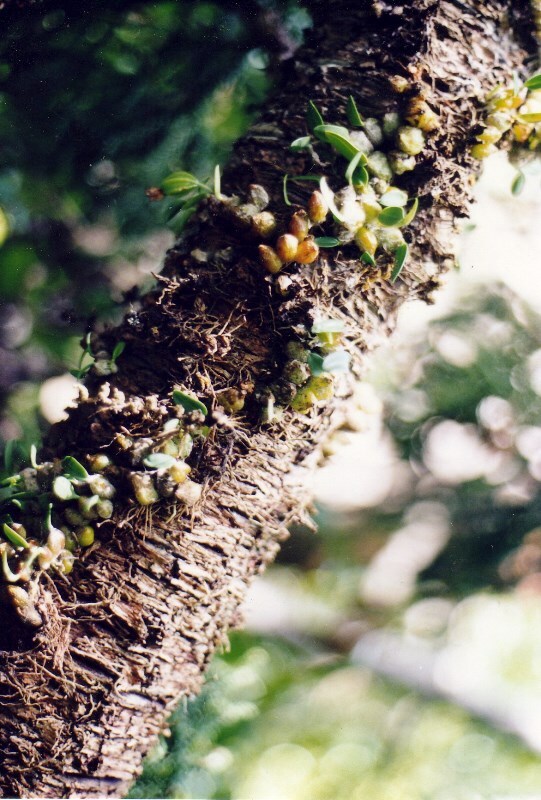 Seed pods were found on the B. weinthalii plants at the second location as well. Our observations suggest that B. weinthalii is a very common orchid species on the Hoop Pines of the region. Our discovery effectively extends the distribution of B. weinthalii some 400 kms beyond its formerly accepted northern limits. Between the Calliope and Dawes Ranges and the Toowoomba district, there does not appear to be much suitable habitat for B. weinthalii. It is reasonable to assume that our new colonies have evolved in isolation for many thousands of years. For this reason, I eagerly await the next flowering season (Autumn 1993). Perhaps its isolation has caused it to be “different” to its southern relatives. Only time can tell. NOTE: Fast forward to 2016. This northern extension of B. weinthalii was different enough for David Jones to describe it as a sub species of the type form. 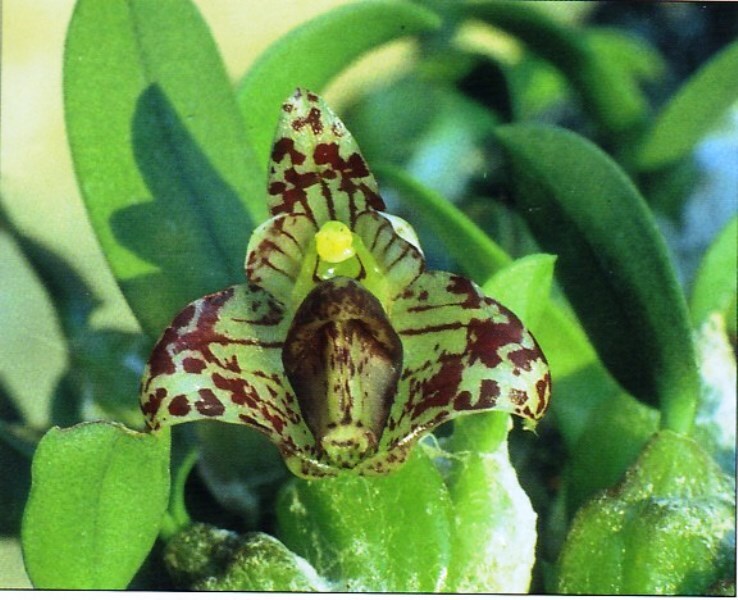 He gave it the name of Bulbophyllum weinthalii subspecies striatum. The flower. Our new population of Bulb. weinthalii was described by David Jones as sub species striatum. “Striatum” refers to the striped lines that appear at the base of the segments in var. striatum. Note: This article was written before the Dockrillia genus was created to accommodate the terete members of the Dendrobium genus. At this time, 2018, both Dendrobium and Dockrillia are both used by various botanists when referring to section Rhizobium members of the Dendrobium genus. I tend to favour Dockrillia. However, at present it is not accepted by the seat of botanical wisdom at Kew Botanic Gardens in England. Therefore, either generic name is acceptable. It was only when I was writing up the preceding notes on B. weinthalii, and relating the other orchids growing with it, that I started wondering about the southern distribution of Dockrillia linguiformis variety nugentii. We had found this tropical variety of the tongue or thumbnail orchid, as it is commonly known, to be quite abundant about the mountains west of Gladstone. It was definitely more common on the harsh, hot, exposed rocky outcrops where it often grew into clumps of several square metres. It was nonetheless often seen in the Hoop Pine forests in the shade. According to the three texts I have consulted, the distribution of D. linguiforme variety nugentii was recorded as follows: Dockrill (1969) Eungella (Mackay); Jones (1988) Eungella (Mackay); Upton (1989) south of Townsville (20 deg. latitude). In the absence of any other recorded sightings to the contrary, I have every confidence in reporting an extension to the range of D. lingujforme variety nugentii of approximately 400 kms south of its previously accepted southern limits. It is unlikely that specimens of this species would be found in the very dry country between the Calliope Ranges and the Mackay region. At the time of our visit, the plants of the Calliope Range were in early bud. At the time of writing they have not yet flowered. Because of their probable isolation there is a slim chance that they may be different in some slight way. There is no doubt in my mind, however, that the plants are obviously examples of D.linguiforme variety nugentii. NOTE: Fast forward to 2018. Thousands of specimens have now been seen of this taxa and there are no appreciable differences requiring it to be further separated out. Only feature noticeable however, is the vegetative appearance of the bulbs. They do not attain the leaf/bulb mass, or length and width of the same species from further north.